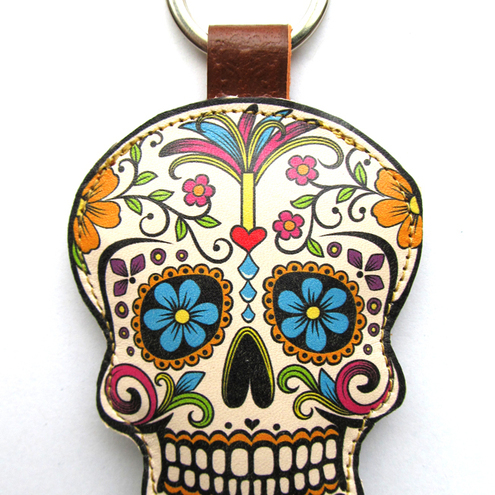 Folksy :: Buy "Leather key ring / bag charm - Sugar Skull"
A beautiful charm to decorate your keys or bag. Made to order these durable and attractive keychains/charms are made of 100% soft padded leather. The design is printed directly on to the leather. A perfect small gift for a loved one or good friend. Folksy :: Buy "Leather cuff/ wallet wristband - Tattoo skull & roses"
Folksy :: Buy "Leather keyring / bag charm - Sugar Skull"
Folksy :: Buy "Leather kindle 2 & 3 case - Springtime"
Folksy :: Buy "Leather kindle 2 & 3 case - Koi"